Like Banksy, Bologna's master of street art first came to the world's attention around 2000. The two have much else in common. Blu guards his real identity closely, and so far successfully, and both have become globe-trotting undercover celebrities. But while Banksy likes to work on a small and intimate scale, Blu shoots for the monumental. Early on he developed a unique style—using cheap house paint, usually white, and rollers on telescoping rods that allow him and his accomplices to cover the entire side of a building in no time at all. 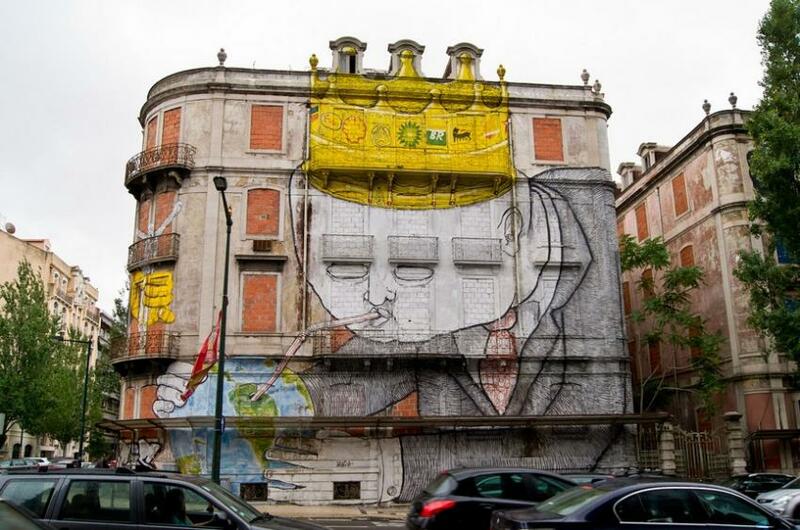 As with most street artists there is usually a political, social or environmental message in Blu's work, especially in the big Bologna murals he painted 2003-06, often in conjunction with his friend and fellow artist Ericailcane. From 2005 he took his show on the road, painting from Berlin's Kreuzberg to London's Camden Town; for a special exhibition he once helped cover an entire wall of the Tate Modern. Blu spent considerable time in Latin America, leaving a number of works in Buenos Aires and in Colombia. His murals often caused controversy, notably the huge one he did for the Museum of Contemporary Art in Los Angeles, which featured rows of coffins draped with dollar bills. The director had it painted over before Blu even finished (in fairness, the artist hadn't considered the Japanese-American neighbourhood war memorial just across the street). Some of his Bologna works, slowly fading, can be seen on a squat at 24 Via Fioravanti, behind the Central Station, and Via Marco Polo, as well as the suburban industrial zones of Via Stalingrado and Via Zanardi. As a measure of how mainstream such street art has become, some of his works and others' have been detatched, like medieval frescoes, and featured in exhibitions, occasioning a fierce debate between those who want to preserve them, and those who argue for the essentially ephemeral, ad hoc nature of the genre. Blu may have invented the 'wall-painted animation', which has become his speciality. These charming, laborious works, in which one 'frame' is whited out as the next is painted, crawl over walls, buildings, bridges and streets, a cartoon with the city as its canvas. All of them are on YouTube.